I don’t understand the hate that Knack got when it launched alongside the PlayStation 4 a few years ago. It wasn’t an amazing game by any means, and it could get repetitive, but it was a fun, competent action adventure romp with a few neat ideas that it executed well. It was no worse than a lot of other similar titles that seem to be held in very high regard, but for some reason it seemed to touch a nerve. The hate was such that when Sony announced Knack 2 at PlayStation Experience last year, the reaction was a mix of pained groans and laughter, and the very existence of a sequel has been the subject a constant stream of jokes ever since. Like its predecessor, Knack 2 is a good game, even if it’s not an amazing one. The basic structure of the game remains unchanged: it’s a third-person action-adventure game, in which you travel across linear levels fighting a variety of enemies, solving puzzles, overcoming platforming challenges, and looking for secrets. That’s a timeless formula because it’s one that works. 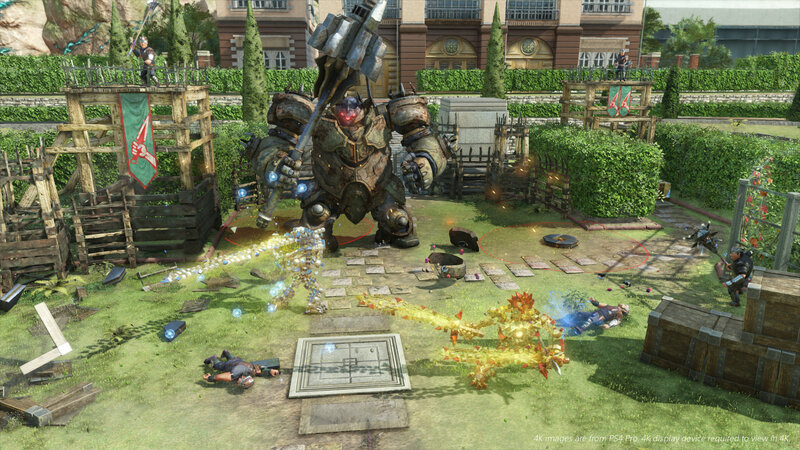 The central idea of Knack is still the same, too: the eponymous hero can change his size by collecting magical relics and absorbing them into his body, growing from a tiny little critter the size of a toddler to a giant, 30-foot behemoth. It’s as exciting as ever to go from struggling against enemies of a particular because you’re tiny and weak to being able to just kill them in one hit by standing on them, and then to go back to having to actually fight because you’ve shrunk again. This was one of the best things about Knack, and it’s one of the best things about Knack 2. However, this time around there’s a lot more variety in everything the game asks of you. A lot of enemies will be familiar to people who played the first game, but there are also a whole lot of new ones that require new strategies to defeat, like heavily-armoured robots and goblins armed with miniguns. 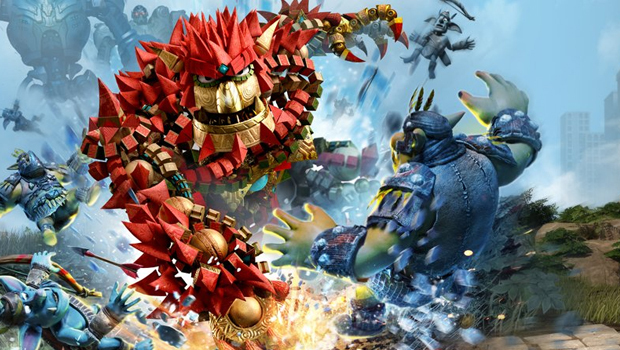 To aid in dealing with this new threats, and just to add more options to combat in general, Knack has gained a suite of new moves, over and above the limited three-punch combo from the first game. Right off the bat, he has a roundhouse kick, which has better range than a punch, and he can block attacks and deflect projectiles. Through story progression and a light RPG system, he learns a handful of new tricks, too: a charged punch that can shatter armour, a hook shot that can pull enemies close, a boomerang that can temporarily restrain a foe, a powerful somersault kick that leaves him vulnerable if it misses. Combat in Knack could admittedly get a bit tedious, but in Knack 2 there are enough variables at play for this to never be an issue. Fighting is also a bit better balanced. Knack was brutal even on its normal difficulty, mostly due to weird hit detection and a heavy reliance on dodge mechanic that can be unreliable. Those can still be a problem, but a few new systems make combat more manageable and give you more room for error. Firstly, Knack’s HP now restores naturally if you can avoid getting hit for a short space of time; he can still die in two or three hits if you’re careless, but there’s no longer an issue with the cumulative effect of small mistakes over the course of a whole level. Secondly, Sunstones now function as a sort of shield, with damage being applied to your Sunstone gauge before your health bar. This gauge doesn’t restore naturally the way health does, so there’s still an emphasis on breaking sunstones and collecting energy when you can. Finally, Knack can now block attacks as well as dodge them, which comes in very handy in those situations where dodging one enemy might leave you vulnerable to another. His guard will break if you try to block too many attacks in succession, but it’s at least another defensive option. Navigation in Knack 2 involves a lot more puzzle solving than it did in Knack, in part due to his new abilities and in part due simply to more puzzle-oriented level design. All of the new abilities that Knack learns through story progression also aid exploration in some way – a charged punch can break rocks, the hook shot can pull distant levers, and the boomerang can hit out-of-the-way switches. Even with his returning abilities, like being able to switch between tiny and big forms, there’s more emphasis on solving puzzles than simply moving across a level and jumping over obstacles. That said, none of the puzzles are particularly difficult, and you can also access hints that show you the solution if you get stuck for too long. 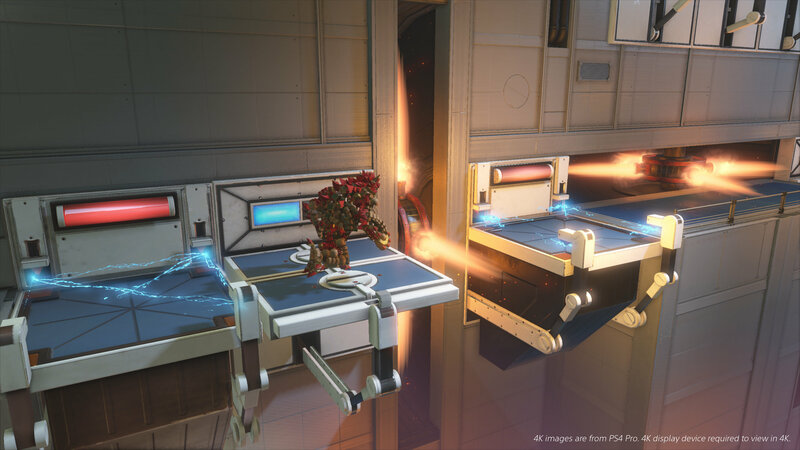 There are more platforming sections now, and they’re more creatively designed than they were in Knack. A lot of these – and, certainly, my favourites – involve using small knack to climb walls by jumping between small bricks that jut out, effectively turning the game into a 2D platformer for a few moments. 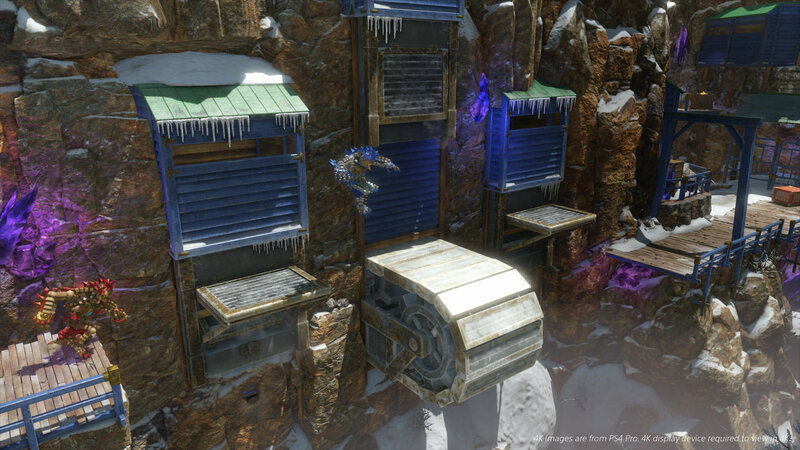 Other sections have you timing jumps between intermittent deadly hazards, using weighted see-saw platforms to reach new heights, leaping between moving cogs in a clock tower, and using visual cues to move across invisible platforms. Knack had its share of platforming moments, and they were some of the best parts of the game, so to see that expanded so much in Knack 2 is great. 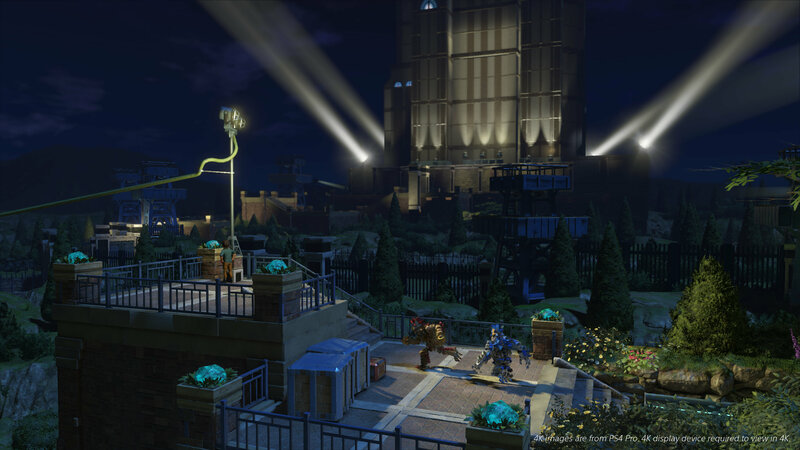 The final ingredient to Knack 2‘s recipe for excitement and variety is the addition of more set-pieces – no doubt inspired by the success of the same in games like Uncharted. There are a lot of cinematic quick time events, chase sequences, and the like, and one level puts you in the driver’s seat of a tank. These sorts of scenes are are always going to be controversial (QTEs especially), but they serve to mix things up and stem the risk of the “normal” mechanics growing stale, and they do that well. What this all amounts to is a game that’s very much the same as the first Knack in its basic structure and design – a fun, familiar action-adventure romp – but with a bit more variety in how you play. It’s not pushing any boundaries, and it might not be the most memorable experience of the year, but it’s plenty enjoyable for the time that you spend with it. Where Knack really fell short, and where Knack 2 does too, is in its storytelling. The overarching plot is a very basic “stop the evil goblins from attack humans” affair, which mostly serves as an excuse to take you around the world to various ruins and cities. They’re fun, varied, and offer plenty of nice sights to see and places to explore, but the story itself never really amounts to anything more than that. This is true of a lot of games, but even a simple plot can work well with a good script and characters. Knack 2, sadly, lacks both. For the star of a character action game, Knack is incredibly lacking in personality, and that isn’t helped by poor writing that often tries to be funny but mostly just falls flat. Knack’s companions mostly follow the same mold; they’re shallow, lack personality, and seem to just exist because the plot demands it. That said, I do like Ava, one of the newcomers – she’s one of the only characters who has anything resembling growth, and it’s always nice to see women of colour in main roles. In short, Knack 2 isn’t a game you’ll play for its gripping drama or compelling characters; it’s a game you’ll play for a bit of light-hearted action-adventure fun. It’s not an amazing game, but it takes what worked in the unfairly-maligned first game and builds on that just enough to feel like a fresh twist on the same ideas. Knack 2 is developed by Sony Japan Studio and published by Sony Interactive Entertainment. It launches September 5 (Americas) / September 6 (Europe/ANZ) for PlayStation 4.